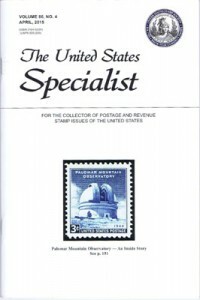 Founded in 1930, The United States Specialist, originally named The Bureau Specialist, has been published continuously since, and is the world’s leading journal of modern U.S. philately. Many important discoveries in U.S. collecting have been published in its pages. Once concerned mainly with the output of the Bureau of Engraving and Printing, the Specialist now covers all U.S. issues, both classic and modern, regardless of the printer. Each month, articles by recognized specialists and scholars treat specific aspects of U.S. philately. Over the years, The Specialist has been especially strong in reporting stamp printing technology related to plate varieties, plate layouts, marginal markings and plate numbering. Many of the varieties it has reported arc now major listings in the Scott Specialized Catalogue of United States Stamps and Covers. In recent years, The Specialist has been examining specific stamp issues in detail. For example, it has covered the difficult Washington-Franklin Head lead Issues extensively, making this series understandable to the beginning collector and more rich for the devoted specialist. Why Advertise in The Specialist?